A bokashi compost system is one of the easiest ways to direct food waste away from landfill and instead create valuable soil conditioner and fertiliser for your garden. Plus, it will help you avoid the need for a bin liner! 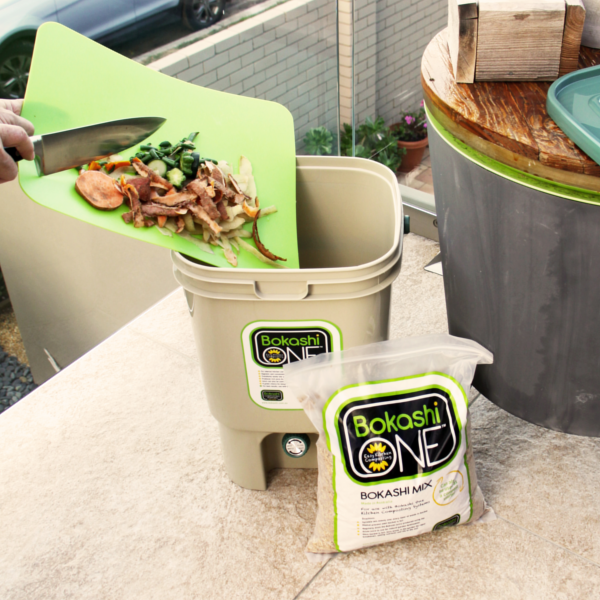 With so many of you interested in bokashi style composting, we’ve answered your most frequently asked questions all in one place. So read on for everything you’ve ever wanted to know about bokashi composting. A bokashi bin is a small composting bucket designed to transform your food waste into nourishing compost and soil builder. It is small enough to fit in your kitchen or in another convenient area in your home. It doesn’t smell, doesn’t attract insects, is easy to use and will help you reduce the amount of food waste sent to landfill. Bokashi is a natural composting method that utilises beneficial bacteria, known as Effective Micro-organisms, to ferment the food waste, and produces no unpleasant odors associated with food decay. Organic matter is broken down up to 10 times faster than traditional heap composting. From this process you gain fermented organic matter loaded with nutrients that must be dug into soil to complete the breakdown into compost, along with a juice rich in micro-organisms that is siphoned off and can be used as a liquid fertiliser. The bokashi bacteria are introduced to your bin either in a grain mix or a liquid spray. 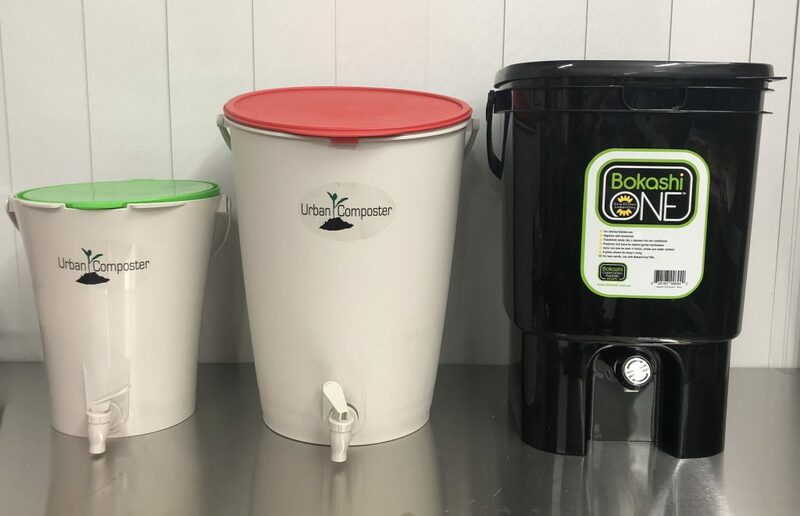 How are the Bokashi One and Urban Composter systems different? The main difference between the Bokashi One and the Urban Composter is the size of the bucket and the carrier mix used. Both systems feature a plastic bucket with a lid, a grate at the bottom of the bucket, and a tap. 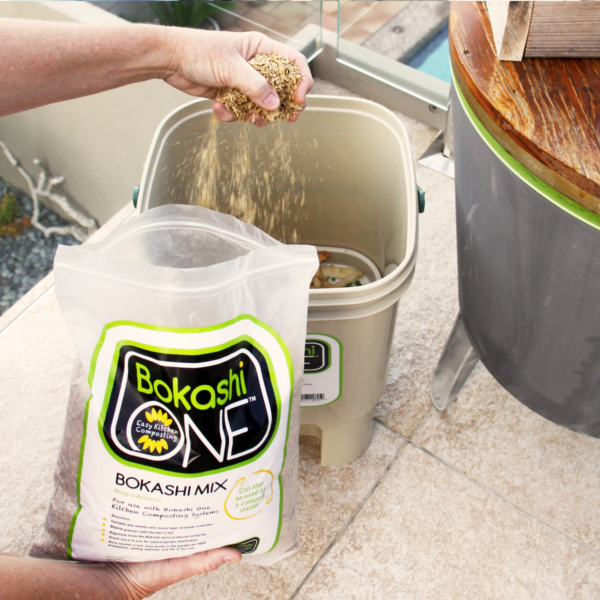 Bokashi One is a sawdust/grain and uses a specially designed Bokashi One micro-organism mix made up of lactic acid bacteria, yeasts, photosynthetic bacteria, actinomycetes and fungi. Urban Composter is a liquid spray and uses cultures of EM-1 (Effective Microorganisms). The Urban Composter EM bacteria is made in a laboratory and does not use any animal products so is vegan. The Bokashi One mix may contain animal derived ingredients, so is not suitable for vegans at the moment. Both options are very good at what they’re designed to do. How do you use a bokashi bin? A bokashi bin is very easy to use. The same process applies to the Bokashi One and the Urban Composter bins. Remove the bokashi bin lid and add food waste. For every 1 cup of waste, sprinkle 1 tablespoon of Bokashi One mix or 3-5 sprays of Urban Composter accelerator spray before replacing the lid. Ensure the lid is closed properly and tightly at all times. Each time you add more waste to the bin, press the layers down using something like a potato masher or cup. It is important to keep as much oxygen out of the matter as possible. Regularly drain the bokashi juice from the tap (you should be able to start draining juice within one week of adding waste). You can use the diluted juice to fertilise plants – 2 teaspoons of juice for every litre of water (do not store for more than a day or so). You can also use the juice undiluted to keep drains clear. Repeat this process until the bokashi bin is full. Once your Bokashi bin is full, the waste is ready to be buried. If you have two bokashi buckets, begin the process again in your second bucket, and leave the contents of the first bucket to continue to ferment for another few weeks before burying. Continue to drain off the bokashi juice regularly. To bury the waste, dig a hole in your garden. The hole only needs to be 20-25cm deep. The compost is acidic when it is first buried, but neutralises after 7-10 days. It is best to wait 2 weeks before planting. Wash your bokashi bucket out after each use using a natural cleaner or plain water. Harsh chemical cleaners are not recommended. What can I put in a bokashi bin? You can put all food waste in the Bokashi bin and Urban Composter, excluding large bones, liquids and already mouldy food. All fruit and vegetable scraps, citrus, meat, fish, dairy, eggs, bread, plastic free tea bags and packaged food can be added. What is the bokashi mix made of? Bokashi One uses a specially designed Bokashi One micro-organism mix made up of lactic acid bacteria, yeasts, photosynthetic bacteria, actinomycetes and fungi. It looks like sawdust or grain. Urban Composter contains cultures of EM-1, the original patented EM technology invented by Japanese Professor Teruo Higa. Urban Composter’s spray is vegan. For every one cup of waste, add one tablespoon of Bokashi One mix or 3 to 5 sprays of Urban Composter accelerator spray. It is better to use too much over too little. How long does the bin take to fill up? That depends on how big your household is and how much food waste you generate. A family of four who is fairly conservative when it comes to food waste might take around 3 to 4 weeks to fill their Bokashi. Does waste compost inside the bin? The waste does not break down in the bokashi bin. The waste in the bin is fermenting and will reduce in volume as it loses water content. The complete breakdown of the waste and the compost process occurs when it is buried in the soil. It won’t smell with the lid on securely, so you can keep it in the house without any problems. When you open the lid the waste will produce a sour smell, similar to what a pickle or cider vinegar smells like. It shouldn’t be a putrid smell. If it smells ‘off’ or really bad it’s time to remove the waste, bury it in the garden, clean out the bin and start again. It is important not to let the liquid sit in the bottom of the bokashi for a long time. You might find you need to empty it every few days, especially during warm weather. If you leave the liquid sitting for a long time it may turn putrid. Will it attract insects and mice? Ensure the lid is on securely at all times and drain the liquid frequently to avoid attracting insects and mice. Is a bokashi bin easy for kids to use? A bokashi bin is an easy way to introduce composting and gardening to kids. 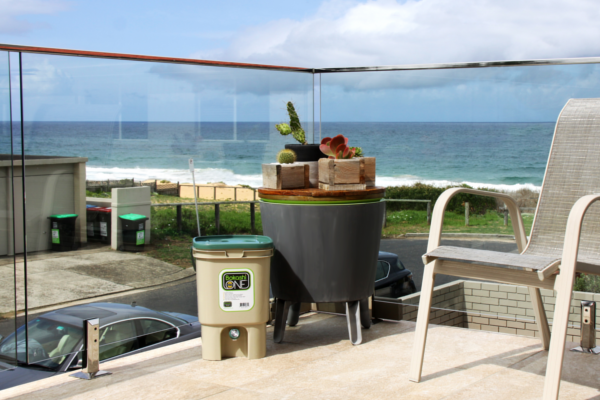 While they may need an adult to remove and replace the lid on the bin, kids can still add food scraps and the bokashi mix or accelerator spray, help bury the waste, drain the liquid and fertilise plants. What can you use the bokashi liquid for? Fertilise plants: Use 2 teaspoons of juice for every litre of water. Keep drains clear: Pour the liquid down the drain. The beneficial bacteria present in the liquid will work to keep drains clear. Do not store the juice outside the bin for more than a day or so. If you do not need to fertilise your plants, dilute and give to a friend or pour on a nature strip. How often do I have to drain the liquid? It is important not to let the bokashi juice sit for too long. You might find you need to drain the liquid several times a week. In warmer weather you might also notice that your bokashi bin produces more juice. What should the bokashi liquid be like? The bokashi juice will be an orangey colour and will smell fruity or like vinegar. It will have white fungal threads floating in it or have a thin white coating. Putrid smelling juice should not be used to fertilise plants, and it is best to dispose of this juice by pouring it down the drain. It will work to keep drains clear. Will a bokashi bin fit under my sink? That depends on whether you get the Bokashi One or one of the Urban Composters and how much room you have under your sink. Some people might be able to fit it under the sink, while others might need to put it in the carport or convenient place close by. Can I keep my bokashi bin outside? You can keep your bokashi bin outside in a cool, shaded spot out well out of the sun. White mould or fungi is growing in my Bokashi bin – should I be concerned? A white cotton like fungi on the top of your Bokashi waste is a sign that the process is working well. It shows that the microbes are doing their thing and the fermentation is taking place as it should. There is no need to be concerned about this. Do watch out for black or very dark coloured mould though. This is not a good sign and you will need to start again. Dig a hole and bury the scraps, wash the bucket out well with a natural cleaner and start again. You will need to wait several weeks before planting where you buried these scraps. How do you empty a Bokashi bin? Dig a hole in your garden approximately 20-25cm deep. In an established garden, dig around plants keeping away from the roots of young plants. Tip the waste in the hole and cover it up with soil. The compost is acidic when it is first buried, but neutralises after 7-10 days. It is best to wait 2 weeks before planting. I don’t have a backyard or a garden to bury the waste in, what can I do? If you have a balcony, bury the waste in a pot plant container. Cover it with soil or potting mix and in a few weeks it will have turned into even more nutrient rich potting mix. Plant herbs or veggies in the pot a few weeks after you have buried the waste. Alternatively, ask a neighbour, family member, friend or community garden if they would like your Bokashi waste. What if I don’t have a compost heap in my backyard? You don’t need a compost heap outside. Simply bury the waste in your garden. If you don’t have a garden, ask a friend or relative or a community garden if they would like your bokashi waste to condition their soil. Does a bokashi bin actually work? Yes! Using a bokashi bin is an easy and efficient way to reduce the amount of food waste your household sends to landfill and create a valuable soil conditioner and fertiliser in the process. And if you follow the instructions above, you will be on your way to creating a successful ferment in no time. Where can I buy a bokashi bin? What if I have another bokashi related question? Leave a comment below and we’ll get back to you! Alternatively, email us at shop@biome.com.au or visit one of our four Brisbane stores. How regularly could I bury the food waste in the same spot in my garden? I have an unused raised garden bed, about 1m x 1m. The rest of my garden beds are covered in bark making it harder to dig in. I would like to be able to just use the same raised garden bed of soil to bury the waste in. Is there a period I would have to wait to bury more? Or just pick a different spot in the same bed? You can continue burying the food waste in the same spot, just wait at least 2 weeks or so each time. If you do plan on planting in that spot in the future, wait approximately 2 weeks after the last batch was buried before planting. My bokashi mix has gone mouldy & clumped together can I still use it to cover the waste in the bokashi bin? What colour is the mould? White mould is fine – you can continue using that. However, black/blue/green mould indicates something has gone wrong. Don’t add this to your bokashi. You can bury it in your garden though. We already use a compost bin & a worm farm for all vegetable matter and other garden waste, and have been considering a Bokashi Bin for meat, bread, dairy and other non vegetable food scraps. If this is all we put in the Bokashi will that work? And can we empty the bin into the developing compost? It would be best to add some vegetable scraps to it every now and then to balance out the protein. You can empty the bokashi bin into your developing compost. Can I use the Urban Composter liquid spray with the Bokashi One bucket instead of the sawdust? Great article it answered some questions I had regarding the fermentation process. The Bokashi one contents are also good to add to your existing compostvif you have one outdoors. I’m wondering which of the bokashi mix or the spray works out to be most cost effective? How many buckets approximately would one get out of a bottle of spray or a packet bokashi mix? I’m interested to know since this would be an ongoing cost of using the bokashi system. The tap on my baby Urban Composter leaks. I’ve screwed it in as tight as I can (the tap is now upside down), but it just started dripping again today. Would another washer help? If i don’t have a garden to bury the bokashi mix and cant find someone to give it to could i dump the mix in my green waste (grass clippings etc) bin to dispose of?